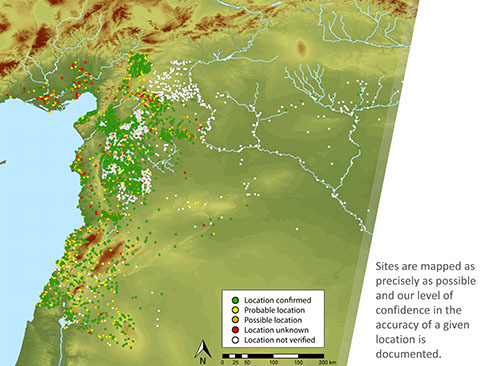 CRANE is developing a general map of the Orontes Watershed that shows archaeological sites that have been identified and surveyed, with their size, name and, where available, period of occupation. This information is being integrated directly into the OCHRE software platform. Using published surveys, the team is scanning, rectifying and digitizing paper maps, then refining the locations using satellite imagery. Because published survey maps are not always the most precise references, especially in the case of older surveys carried out before the advent of GPS, it became quickly apparent that great attention had to be given to the mapping of individual sites, lest we ended up accidentally duplicating sites simply because they were imprecisely located in one publication or the other. 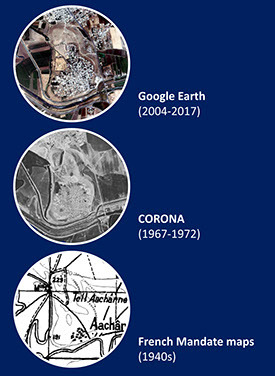 We now mostly rely on modern Google Earth images, historical CORONA ones, as well as French Mandate maps to locate given sites. Additional information can also sometimes be obtained from the Russian topographical maps and the ASTER GDEM. Although modern images are of a much better spatial resolution, older datasets preserve a record of a richer archaeological landscape where smaller and lower sites had not yet fallen prey to the increases in population, mechanization and industrialization of the last few decades. The highly detailed French Mandate maps of Syria and Lebanon also often preserve older or alternate name of locations, which makes relating older publications to the modern landscape much easier. This step of visually identifying sites is by far the most time-consuming one, but remains unavoidable if we which to maintain a coherent system Some sites have been destroyed, or may have been offset or poorly mapped – challenges that require extra research to pinpoint the location. The project is also scalable. The map already includes sites in southern Turkey, Syria and northern Lebanon, and is expanding towards central Anatolia. This site database will serve as the backbone for many of the separate CRANE sub-projects, allowing for parsing and visualization of the data within a geographical framework. 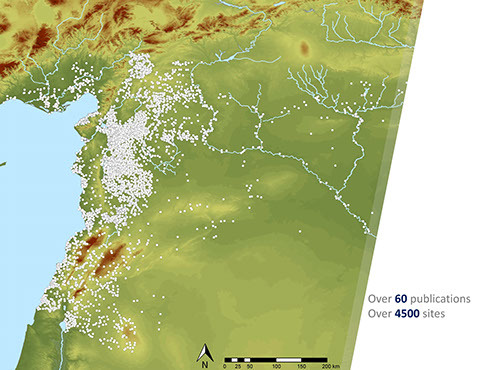 Identifying all settlements within a specific time period can help the simulation modeling reconstruct areas of interactions of ancient kingdoms, help reconstruct trade routes, or even when certain environmental elements such as lakes or swamps developed or disappeared. By linking the settlement data to the ceramic typology data, all sites with certain ceramic markers or patterns in production can be identified and visualized on-the-fly, or can as well be fed into the simulations to further our understandings. 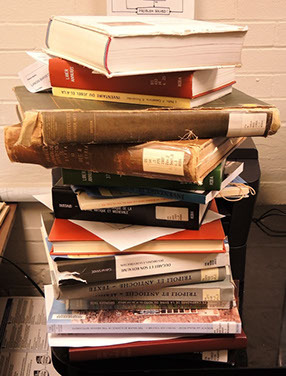 The chronological and bibliographical data from this database is playing an important documentation role in the Cultural Heritage Initiative, documenting the impact of the civil war on cultural heritage of Syria. Doctoral fellow Dominique Langis-Barsetti (University of Toronto) led the team that collected data from dozens of surveys conducted from the 1930s to the present day, the regional database includes over 4400 sites and an additional 100 sub-sites, namely subdivisions of larger settlements which surveyors felt were important enough to warrant their own entries. These typically include sites spread over multiple mounds; divided between a mound, a lower city, and a necropolis; or spread across multiple caves. Whereas some authors prefer to give these subdivisions their own unique identifiers, we decided instead to keep related entries linked together under a single parent entry so that the total number of CRANE IDs reflects more accurately the density of the database.